There’s no denying that Twitch is one of the most popular and free ways of entertainment. From IRL streams to gaming, art, coding and many others, people from all over the world share their personality or skills with others, and in a lot of cases, make some good money from doing so! Introduction aside, I bet at some point you were watching someone streaming you thought to yourself “maybe I could do this sometime”. Well, you definitely can, so let’s see if you want to! Why should you stream on Twitch? There are tons of reasons to stream on Twitch, from meeting other people and making friends to even starting a successful career as a professional gamer or entertainer. I mean, take a look at the Overwatch League players. Do you think they just got recruited out of their bed? Nope, some of them were streamers for long before Overwatch was even in the works, playing all kinds of games and being good at it, making YouTube compilations and building an audience along with a “portfolio”. That, right there, is where streaming on Twitch contributed a lot to their future careers as professional gamers, even if they didn’t know it back then, or even without having thousands of viewers. Now, this might not be your intention to become a professional gamer, but it was an accurate example of how streaming your gameplay can help you even without you realizing right away. Having that said, let’s get right to it, and explore the 5 reasons to stream on Twitch yourself! Streaming on Twitch isn’t always just about viewers and money. Like, when you’re playing a game all by yourself, you rarely ever get the chance to realize what went wrong at a particular moment, or if there was something that you personally could’ve called for or done differently. Another example, consider a League of Legends 1v1 where you get outplayed, but you are sure you could’ve handled it differently. Wouldn’t it be better to watch it, slow motion or not, and see what you did or didn’t do, and perhaps even learn from it? Pretty sure it would! Don’t have a friend with whom to speak on Discord or Skype? No problem! Fire up your Twitch stream and play the game as you normally would, and feel free to talk as if people are watching you. Despite not being one of the most popular reasons to stream on Twitch, this is a great way of dealing with loneliness and even perhaps depression. It will also keep you a lot more focused on what you’re doing as opposed to allowing your thoughts to race freely while playing silently. Add to that that if you’re streaming on Twitch, even if you’re new, you’re bound to get an occasional random viewer every now and then. Viewers love hearing someone talking alongside their gameplay, not listening to the in-game sounds and the keyboard getting mashed, and you can very quickly make some friends among them with whom you can play the game. Speaking of viewers, don’t be afraid to engage them when you see them in your stream’s channel. Most of them are used to watching big streamers and rarely do they get the chance to have their questions answered, so why not you be the one who gives them some attention! We’ve all been there, in that very moment when you just want to get it off your chest and unload your frustration onto a player, whether via game chat or voice comms. It’s natural and understandable, although not nice and quite unhealthy. More so, it can even lead to an account ban from that game, especially with games such as League of Legends, where toxicity and negativity are taken extremely seriously. By streaming on Twitch and talking to your viewers, you can counter and even block that impulse knowing that there are other people watching you. And also, between you and me, I know it’s not always “that other guy’s” fault. Sometimes you make mistakes as well, but if you’re streaming your gameplay, an impulse of rage can always be converted to a funny moment and a LUL emote spam. Once you’ve started streaming on Twitch, and once you realize you’re actually enjoying it, you’ll want to do it more often! Now, what’s the best way of ensuring that, along with the fact that your viewers will be there to watch you? Schedules! Viewers love a solid schedule that’s followed through, and some might even plan their day based on your stream schedule. This will give you a very good reason to go to bed early and get up in the morning and do your daily chores, so you can chill with your viewers and play some games in the evening! While this might be a bit easier said than done, if you enjoying streaming, it won’t feel like an obligation. If needed, you can always skip a day or two should you need to attend something else, but do make sure to Tweet about it, as to not disappoint your viewers. No, I wasn’t gonna forget about this. Also, it rhymes too! So yes, last but not least, making money from your hobby, namely streaming on Twitch! It doesn’t get better than that! Although this is one of the most popular reasons to stream on Twitch, there is a catch though – you shouldn’t think only about making money, and you shouldn’t try tunneling your stream towards that. Many people start streaming knowing very well that Twitch is a gold mine, but if your sole purpose is to make money, especially fast and easy, you’re gonna most likely be disappointed. You need to put in the time and effort, have good, funny or enjoyable content and personality before you can think of making any decent money from streaming on Twitch. You should also try identifying the audience you want, and see if you can cater to them, just like any other business with their very own niche. Alongside donations and subscribers, you can also get sponsorships (even from your local town) and free games, or even have people contacting you to display a paid ad or logo on your stream. There are quite a few ways of making money on Twitch, but you do need to put in the time and effort. When you do start to make money from your stream, then it’s recommended to upgrade your Twitch channel’s graphics. The first thing you should do is upgrade your Twitch stream’s overlays. Since your overlays are the most visible, it’s important to have a professional design to impress your viewers! 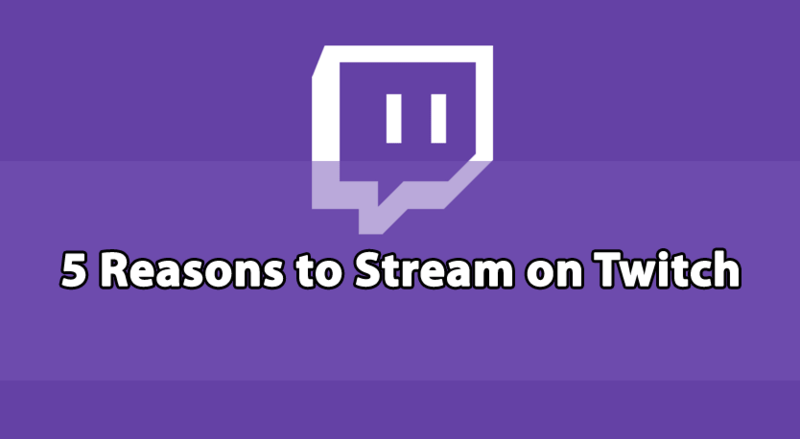 I hope our 5 reasons to stream on Twitch has laid to rest any questions or doubts you might have had, and even encouraged you to start your career and hobby as a streamer! Whether you do it for fun, dealing with lonely times or to start a career, streaming on Twitch can be one of the most enjoyable things that you can do from the comfort of your home. So, don’t waste any more time, and get on designing your stream’s layout!